SP Acoustics SP1 Signature review | What Hi-Fi? Start-up company SP Acoustics was formed by Steve Philips, once head of R&D at Acoustic Energy, and the man responsible for the sonic performance of many of the firm's most successful products. In most ways this hulk of a speaker is as uncommercial as things get. They're massive: each cabinet is about the size of a fridge and weighs 45kg. On the plus side these speakers can be ordered in just about any colour imaginable. That 120-litre MDF coffin of a box is lined with ceramic plates to improve rigidity and help control resonance. The quartet of drive units in this three-way design – 19mm soft-dome tweeter, 10cm paper-pulp midrange and twin 16.5cm aluminium bass units – are straight from Danish OEM supplier Scan Speak, and are part of its high-end Illuminator range. While these units don't boast materials such as diamond or beryllium, they are still straight out of the top drawer. The one technical surprise is the absence of a bass reflex port. Excited? No, we didn't think so. Start listening to the SP1s and the first thing to stand out is their agility. They're stupendously responsive and track signals with the determination of a blood hound. Dynamically and rhythmically they're world class, starting and stopping with breathtaking precision and delivering wide dynamic swings with astonishing composure. Perhaps even more impressive is their dynamic fluidity, which makes even exceptional speakers like ATC's SCM 50s sound mechanical in comparison. The good news doesn't stop there. Despite the use of four drivers per side, integration is utterly seamless and the tonal balance about as neutral as it gets. Some might want a smoother, more friendly presentation, but we just want to hear the unvarnished truth – and the SP1s deliver just that. What they don't do is emphasise flaws – in recordings, or your system. 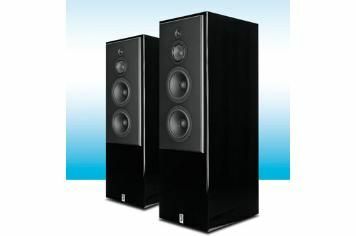 That quality makes them far easier to listen to over long periods than other highly analytical speakers. You'd expect a speaker of this type to deliver high volume levels and loads of bass. And the SP1s do. They go loud with ease and remain impressively refined when pushed hard. On a quick listen you might think they don't have as much low-end as suggested by their size – but few rivals come close to this speaker's ability to define complex textures in this region. The SP1s are happy on all types of music. They thunder along with the Inception OST, but still do justice to Antony and the Johnsons' Another World, where the vocals are pristine, brimming with emotion. Downsides? These speakers don't quite disappear into the sound stage as well as some of their rivals – the possible disadvantage of having such a big cabinet – and… well that's it. Provided you have the space (and money), we strongly recommend the SP1s. They're easy to drive and not particularly fussy about positioning as long as they have room to breathe. They really are some of the best speakers around, and despite that hefty price, pretty much all the competition comes in at even less palatable prices.